In the Student Union Building of Cal Poly Pomona, over a lunch of Gummi Bears and sodapop, the members of the Buddhist Assn. are gathered to learn about the religious traditions of their parents and grandparents. They say it is one part of the family heritage their relatives all but left behind in China, Vietnam or other countries where Buddhism has thrived. The six students, all of them Asian American and all of them men, although women would be welcome, want to know everything about their spiritual roots. Since this is America, however, they are learning from experts quite unlike those who taught their elders. Their teachers are likely to be as American as a Diet Coke. Today the students' guest is the Rev. Kusala of the International Buddhist Meditation Center in Los Angeles. 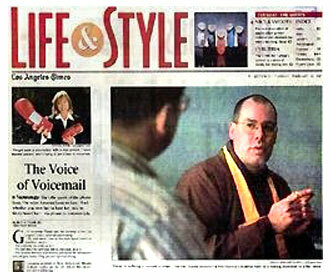 Born in Iowa, raised Lutheran, 47 years old, he wears the brown robes and shaved head of a Vietnamese monk. He was ordained 12 years ago at the same time that he graduated from the College of Buddhist Studies in Los Angeles. Kusala represents the growing number of Westerners taking leadership roles and passing along a heritage that for centuries was preserved by Asian monks and nuns. The maturing of Buddhism in this country is not the only recent development for the religious tradition founded in 6th century India. As Buddhism takes root here, increasingly it is a hybrid that combines traits from the many varieties practiced in countries throughout Asia. In the process, a distinctly American Buddhism is evolving with characteristics all its own. Members of Kusala's audience at Cal Poly say their parents are not as qualified to teach them because they have lapsed or simply go through the motions of their religion. Not unlike some Americans who were raised Christian or Jewish. "My parents call themselves Buddhist, but they don't really practice," says Tony Lieu, 21, of West Covina. Born in Taiwan, he immigrated to the West at age 8. Now he wants to go back to his religious roots. "I practice on my own, by choice," he says. Kevin Chiang, 27, of Rowland Heights was raised a Christian. "In ninth grade, I visited my aunt in Korea, and she sent me to a monastery for two weeks," he says. "That changed everything. Now, I want to stay true to myself as a Buddhist." A true Buddhist, American style, is a disciple of a certain stripe. This country's cultural diversity has made American Buddhism yet another expression of the melting pot. "All of Southeast Asian, Tibetan, Japanese and some Chinese Buddhism are alive and well in Los Angeles," says Ken McLeod, raised Episcopalian, now a Tibetan Buddhist who teaches meditation at his Culver City institute, the Unfettered Mind. At the Zen Center of Los Angeles, Abbott Nyogen sits with legs crossed, Buddha style, in a living room filled with Japanese furnishings and photographs of Maezumi Roshi, a Japanese Zen priest who founded the center in 1967. Nyogen, 60, was born William Yeo in Colorado and raised in the United Methodist church. He started practicing Zen more than 30 years ago. From the beginning, his teacher expected that his students' native culture would affect their religious practice. "Maezumi Roshi's whole goal was to allow an American form of Buddhism," he says. Maezumi Roshi's dream is coming true. This year, two Japanese-born monks, one of them a woman, have come to the Zen Center to continue their studies and practice with Nyogen. "Most religious institutions in America are like a mall," says Ananda Guruge, who served as Sri Lanka's ambassador to America until 1994 and now teaches Buddhist studies as a visiting professor at various American universities. "People are looking for what they want, not necessarily from just one Buddhist tradition. They shop around for what the different traditions can provide." In Los Angeles, they don't have to look far. "Buddhists who never knew one another in Asia are coming together in Los Angeles in a rich diversity of immigrant Buddhist traditions," says Diana Eck, a professor of religion at Harvard University who has completed documentary films on several newly prevalent religious communities in America as part of her "pluralism project." "Los Angeles wrote the book on Buddhism," she says. "It is radical for these various cultures to come together as they do. The city represents the whole range of Buddhist traditions: Vietnamese, Tibetan, Chinese, Korean, Japanese and others. "It is not unusual for a religious tradition to change when it enters a new country," Eck continues. "In China, Buddhism was largely centered in filial piety and the family. In Southeast Asia, it was largely monastic. The difference is, in the United States we can see the changes happening." The majority of American-born teachers are lay teachers. The minority are monks or priests. "That is a significant difference," she says. About half of all American-born teachers of Buddhism are women. "It's a reflection of American culture; it comes from the feminist movement that started in the '60s and it's radically different from the situation in Asia," she says. The emphasis is on practice, and meditation is central. "We wanted something to do, not something to believe," Tworkov says. "In our own religious traditions, Judaism, Christianity or another, we didn't have anything to do. The meditative and contemplative practices of Christianity and Judaism had been lost. That's what we were looking for." It doesn't surprise her that Americans imported Buddhism. "We already had chopsticks and cars," she says of the '60s generation that was particularly drawn to Buddhism. "But we didn't have a worldview. We didn't have clarity about where we fit in relation to the rest of society, the world, the cosmos. Buddhism teaches the interdependence of all things. We had an intuitive sense that this was right." Tworkov also observes that American Buddhists are vigorous students of the tradition. "Nothing is taken for granted," she says. "Everything is investigated. It is a completely different ethos than if you were growing up with Buddhism in your family." Also intensely American is the emphasis on social activism among Buddhists. "In the West, we see how people can actually do things to improve the world," Tworkov says. "We can pass laws and work toward creating a more civilized, enlightened society. It's not up to divine intervention. Asia has no great history of this approach." As part of his Buddhist practice, Kusala organized a prison ministry. He teaches at the Juvenile Detention Center of Los Angeles County, where he is building a program that includes study, meditation, tai chi and yoga classes. He also works at the California State Prison in Lancaster, where the inmates, all adult men, are currently most interested in acquiring incense and prayer beads. "I finally realized they want to form an identity. These symbols help them feel like Buddhists," he says. He is moving the inmates toward the next level of thinking: "Now that I am a Buddhist, I need to relate to the world a certain way." Kusala explains the essence of that way when a student at Cal Poly Pomona asks what it means to be a Buddhist. "Cause no suffering to yourself or others. And, as long as you are purifying your mind, actions and speech, you are following a Buddhist path."